mxdwn: Tell me a little bit about bringing Ash into the Game. Richard: Well it’s amazing, obviously. Côté: Obviously a lot of us are big fans of the character and the Ash Vs. 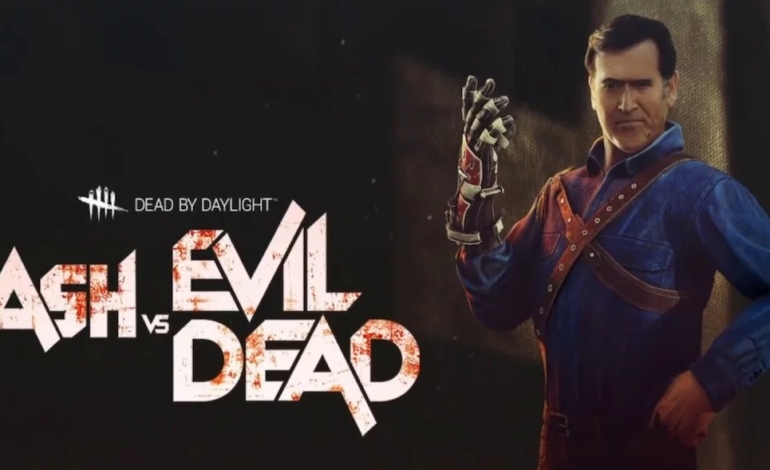 Evil Dead, that series was amazing. So it was a huge deal when we were actually in contact with the license dealers, but it came together really quickly. They knew the game, they were excited we wanted that character in so it was sort of a match made in heaven. It’s kind of easy to find iconic killers to put into the game, but survivors are much harder to find in the lore of the history of horror movies, there are not that many iconic survivors; And so it was just perfect. mxdwn: So tell me how he’s going to fit into the game. What are his skills? Richard: I can do that, yeah. So obviously, like all other characters he has his full progression, you can unlock a prestige outfit like them and he has the three perks as well. The first perk is called “flip flop” so that one will allow you to transfer your progress from the recovery when you’re in the dying state to the wiggle action and he will be able to escape the killer much faster if he’s on the ground. The other one is called “buckle up” so this one is the heroic aspect of Ash. So with this one you can see the progress of recovery of other survivors to lead to their auras. So when you heal them you and the other survivor will see the outline, the aura of the killer for a couple of seconds. That means you can do clutch saves on dying survivors and see the killer to escape easier. The last one is called “The Meddle of Man” this one is a pretty powerful second transfer and is deactivated at the beginning of the match but activates when you use it for the third time. And once it’s activated the next thing, the fourth hit will be ignored completely. So that’s just it, but the price to pay is that once it’s activated and he’s fully healed the killer can see your aura anywhere for the rest of the game. mxdwn: So it’s a do or don’t? Côté: It’s really a great way to show the side of Ash that evil will always haunt him. mxdwn: Going back to the characters roots, nice. So with him, does he have a specific killer that’s coming in? Côté: No, he’s outside of our regular chapter delivery. We just had a chapter delivery, “Demise of the Faithful”, and he’s coming next week. So he’s already here. People can play him here on the floor, but he’s coming next week for everyone. On PC, Xbox, PS4. mxdwn: So what was it like working with the franchise of Ash vs Evil Dead? Côté: It was pretty smooth! The challenge we had this time was you obviously can’t do Ash Williams with Bruce Campbell, so this is the first time we do a likeness in the game. We had a few rounds of iterations back and forth of the face to make him [Bruce Campbell] proud to see his face in the game. So it was very important for us to get that right and it was very important for him and the license holders. But other than that it was pretty simple to work with them. They were excited about the game so they knew what they were getting into so it wasn’t like a hard sell. mxdwn: So you said that this wasn’t part of a chapter, so it’ll just be him and his perks, nothing else? Côté: That’s right. But! He is the first licensed character we have that comes with multiple outfits. mxdwn: What are the alternate outfits? Richard: Well you can see them here in the game. Côté: There’s the basic outfit, and then there is the prestige outfit. Richard: Then taken from the show you have the Value Staff outfit, and the Hawaiian shirt and shorts. mxdwn: I’m sorry the what? Richard: So we don’t want to change his head, because that’s Bruce Campbell, we have a new customization for him. Which is the hand. So of course you have the mechanical hand, but then you have Ashy-Slashy which is the puppet in the show. And there’s also the wooden hand. So that’s what you will be able to customize in the game. mxdwn: So will the Chainsaw hand ever make an appearance? Richard: No chainsaw, no shotgun. mxdwn: Oh no! But that would make him a little bit over powered? Côté: There you go. Usually that’s the fun thing about the character. In the show, you often see him when he has moments when he doesn’t have access to his chainsaw, and doesn’t have access to his gun, and that’s when things go pretty badly. That’s—that’s how we wanted to portray him in the game. Things tend to go pretty badly in Dead by Daylight for survivors. Getting the chance to play as Ash was absolutely fun. Having been able to pick out his perk “The Meddle of Man”, but sadly there wasn’t a chance to use it during the demo. But seeing Ash run around in a Hawaiian shirt and some shorts was fun. And hearing Bruce Campbell return for the voice is always something to look forward to, even if it is just screams of agony from being hooked. Ash will be fully available for Dead by Daylight on April 2, 2019 for PC, PS4, and Xbox One.